Best of all worlds! Rich and elegant to fun and funky, this enchanting one-level, 3 bedroom, 2 bathroom, 1600 SF Stoney Creek Cabin on 2 acres has rich wood paneling as well as cheerful, vibrant color walls. 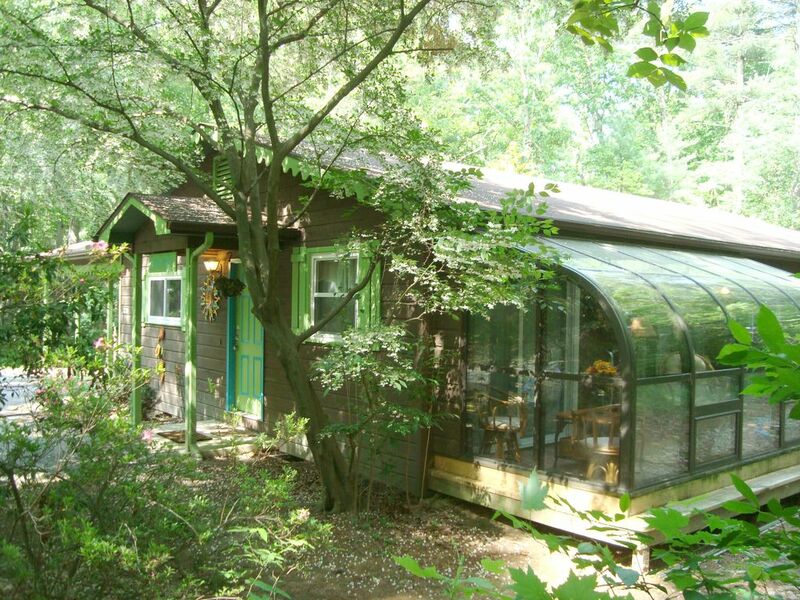 Nestled on a lush 2 acre forest with a rippling creek, this secluded cabin is located right in town with easy access to local restaurants, shops and area activities. Family Recommended! Babies, children & pets (dogs) are welcome! Included in the many amenities are: large hot tub (always with fresh water), awesome massage chair, free high speed wireless Internet, gas log fireplace, central heat & air, 50” HDTV/DVD & premium channels, HDTVs/DVDs in each bedroom, generous DVD movie selection, PlayStation 2 & games, ping pong table, hammock, large gas grill, outdoor playground with slide, swings & fort, fire pit for marshmallow roasts, picnic table under the tree canopy, 80 gallon water heater for plenty of hot water, large capacity high tech LG washer & dryer for your use, quality linens and tasteful, fun décor. LOCATION: This secluded cabin in the woods is right in town with no winding mountain roads to navigate. It is only 7 minutes south to historic downtown Hendersonville’s Main Street quaint shops, galleries and great restaurants. Plus it is a quick 20 minutes north to Asheville. It is 3 miles south of Interstate 26/Exit 44 and a 1 mile from Highway 25. LIVING ROOM: Furnished in warm lime colors against a backdrop of dark wood walls & hardwood floors, the living room gives off a warmth and charm that wraps you in elegant comfort. The cathedral ceiling, rustic stone fireplace with gas logs, chandelier, exquisite furniture, wall of windows and rich artwork further define the room with a restful ambiance. Sit back to enjoy the 50” HDTV/DVD/BlueRay with surround sound with premium stations and large DVD movie library. One of the sofas is a queen sleeper. Just outside the sliding glass doors are a deck with a gas grill, patio table and chairs as well as a sunroom. DINING AREA: Open to the living room, the cheerfully painted dining table & chairs, colorful paintings and chandelier is the perfect place to enjoy your meals. Or you may choose to eat at the outside patio table or at the shaded picnic table under the trees. KITCHEN: The lush roses, lavenders and greens of the hand-painted dinnerware is reflected in the colorful kitchen walls and artwork. Extremely well stocked, nearly every tool and appliance is here to please the most discerning chef! See the list of kitchen amenities below. You’ll appreciate the custom Corian countertops & molded sink, plenty of cabinets & counter space, new stainless steel LG appliances, quality dishes, cookware, sharp cooking knives, coffeemaker and grinder, and lots of handy gadgets. 3 BEDROOMS: Each bedroom reflects a unique character of furnishings and colors - what a fun blend to find in one home! All of our beds have premium plush mattresses, 400+ count cotton sheets, quality blankets and comforters to insure a great night’s sleep. 1. King Bedroom Suite with a private bath has rich paneled dark walls and contrasting painted headboard, dresser and artwork, HDTV with built-in DVD player, large closet and view to the lush back yard forest. 2. Queen Bedroom Suite with attach bath is elegantly furnished with a soothing wall color has a dark wood sleigh bed, dresser and end tables. There is an HDTV with built-in DVD player for your private enjoyment. 3. Kids’ Bedroom, decorated in a variety of fun colors, has a bunk bed with a pull out trundle to sleep 3 as well as a full size crib. This room also has an HDTV with built-in DVD player and lots of children’s DVD movies. For the additional guests, the living room has a queen sleeper sofa. The master bathroom is large and elegantly decorated. There is a tub & shower combination with grab bars for safety. The towels are plush and plentiful. The second bathroom can be accessed from both the queen bedroom as well as the laundry/playroom just outside the kids’ bedroom. This charming small bathroom has a walk-in shower for those who cannot step into a tub and has grab bars for safety. The towels are soft and plentiful. LAUNDRY: The large laundry room just off the kitchen and kids’ bedroom has the latest high tech oversized LG washer and dryer. Painted in cheerful colors, there are additional shelves full of games and stuffed animals for the children. A KID’S PARADISE: Children can spend hours outdoors playing on the PlayNation set with slide, swings, climbing wall and fort; playing ping pong as well as exploring the bubbling creek at the back of the property. For indoor entertainment there are an abundance of games, stuffed animals, kids’ books & movies and Playstation 2 game player with a dozen games. Parents need not worry about dishware as there are plenty of plastic dishes, glasses & sippy cups. FOR BABIES who are our very important guests, there is a full size crib with bedding, high chair, sturdy stroller, Pack-N-Play and cuddly stuffed animals. OUTSIDE: Perhaps the best feature of this delightful cabin is the gorgeous natural woodlands setting. Graced by tall evergreen trees, an abundant variety of blooming deciduous trees & the dancing creek with bubbling water sounds, this tranquil place is restful to the soul. There is plenty of room to wander or to just relax on the patio deck, lounge in the big hot tub or sit under the trees at the picnic table. The Stoney Creek Cabin is recently remodeled and well maintained with new plumbing, windows, floor joists, roof, hot water heater (80 gallon), heat & air system, gas logs, hot tub, kitchen and bathrooms. YOU are my full time business! With all my special touches, the STONEY CREEK CABIN is a warm inviting home rather than a 'vacation rental house.' You'll appreciate the tasteful decor and thoughtful care this home reflects. With all the special touches, I promise you will feel as though you are staying at a friend’s warm inviting home rather than a 'vacation rental house.' You'll appreciate the tasteful decor and thoughtful care my homes reflect. It has been lovingly remodeled, elegantly furnished, beautifully decorated and thoughtfully accessorized with special amenities to pamper you including massage chairs, hot tubs, high speed wireless Internet, king beds with sumptuous bedding, HDTV’s & DVD's, movie libraries, quality well-equipped kitchens, fireplaces, central heat & air conditioning, washers & dryers and much more! all the amenities offered for babies and children. There are cribs, pack-n-plays, strollers, high chairs, baby bath tubs, stuffed animals & blankies. Older children love to play on the outdoor playgrounds with forts, slides, swings, climbing walls, etc. plus games, books, toys, kids DVD movies and more. Kids of all ages love to roast marshmallow at the firepits. easily accessed, right in-town, close to grocery stores, restaurants and shopping. No winding mountain roads to get lost in or long drives to town. The homes are in peaceful, lush vacation spots where you can relax and feel at home. Rather than dealing with a third party management company with limited business hours & knowledge of a home, you can deal directly with me, the owner. I am available to you 7 days-a-week, anytime between 9 AM and 7 PM and after hours for emergencies. YOU are my full time business! Because I live locally, I am available whenever you call. SEE MY WEBSITE LINK BELOW FOR 50+ PHOTOS & ALL 10 OF MY ASHEVILLE & HENDERSONVILLE VACATION RENTAL HOMES! Top quality, soft & luxurious linens will spoil you! LG latest, high tech large capacity washer. No center agitator to stress your clothes and watch it clean through the see-through lid! Comfortable sofas (1 is queen sleeper), massage chair, stone wall with gas fireplace, fun artwork, & open to dining area. Plenty of windows and glass doors to patio and sunroom. Fun hand-painted dishes and quality flatware. Fully-equipped kitchen with lots of extras to please any chef! Very private large hot tub always filled with fresh water when you arrive. We leave you instructions, test strips & chlorine to keep it fresh during your stay. Lovely home . Everything plus extras provided, even entertainment for kids. Would recommend for all. Four year old loved the swing set and toys, husband loved hot tub. Truly a great place. We really enjoyed our stay . It has everything you could ask for in a home away from home . So peaceful and charming . Beautiful neighborhood. Cozy and inviting cottage. Quiet and peaceful. Easy access to stores and dining and Tryon International Equestrian Center. Stephanie was very helpful and accommodating. We were two couples staying for almost 2 weeks, and it was almost perfect (except for the rain - but that wasn't the owner's fault). The whole experience was first-rate, and the owner was very professional, very friendly, and genuinely cared about our experience. Everything was as-described and as-pictured… and more. For instance, all the appliances are new and top-of-the-line stainless. There were also kitchen things that you just don't expect in a rental: things like a slow cooker, a stand mixer, and an electric griddle for SERIOUS breakfasts. But it was Stephanie's attention to the details that was such a delight. And all of the details were focused on the guest experience. For instance, aside from a lot of pre-arrival information to help us plan the trip, there was also a ring-binder in the house with instructions, suggestions, and explanations of EVERYTHING, from how to stream Internet content to the big screen in the living room to where the electric panel is. We came to refer to the binder as the Stoney Creek Bible. There were even labels in strategic places to explain what the various wall switches controlled. None of us had kids with us, but it's an understatement to say that the cabin is child-friendly. There are board games galore, more DVDs than you could watch in a year, strollers, high chairs... the works. Stephanie also has someone come by and check everything before guests arrive, from the televisions to the light bulbs to the hot tub. Before we arrived, I called Stephanie to let her know we were nearly there, and she let me know that they had discovered earlier that day that one of the bedroom televisions had died, but not to worry - a guy had already diagnosed the problem and was out purchasing a new replacement TV, and she apologized that that bedroom might be messier than it should be (it wasn't). We were still unpacking the car when a serviceman arrived, mounted and tested a big new TV, tidied up, and disappeared. We all agreed that we'd be glad to stay again at any of Stephanie's houses in the area, knowing that we'd be well cared for. Such a gracious hostess paying attention to detail! This cabin had everything our family needed and then some! It was charming and so much fun! We had a wonderful stay at the cabin. So relaxing! Loved the hot tub and loved the space of the yard! We will be sure to contact Stephanie again!